Walmart is planning to start their Black Friday “celebrations” off with a bang. In a recent post on their official news site, Walmart announced that they are devising the most epic Black Friday event of all time. They plan to achieve this through a combination of having the lowest available prices and by increasing the amount of items available for sale by 65% (over last year’s offering). Walmart has also announced that they will be introducing a brand spanking new (and actually quite innovative) shopping process, as well as confirming the continuation of their One Hour Guarantee program that was introduced to shoppers last year. For the first time ever (at Walmart), customers will no longer be forced to joust their way through hordes of deranged shoppers in order to pick up any of the “Hot Items” that will be available for sale on the day. Prior to the 6:00pm event, shoppers interested in picking up these specific items (like the Xbox One and the PS4) will be able to go to a designated line and secure a wristband. After this wristband is obtained, the customer will then be able to return to the line at any time within the next two hours to pick up their item. It is important to note that these bands will be in a limited supply, so it is best to go early and pick them up while supplies last (i.e. when the wristbands run out, the item is no longer in stock). 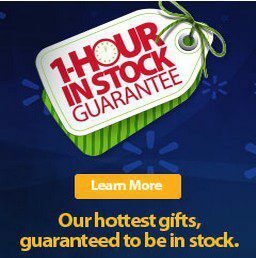 Due to an overwhelmingly positive response from their customers last year, the Walmart One Hour Guarantee program will be making a much appreciated return. Boasting a much larger selection of items (13 items up from 3 last year), it is sure to have the sardine packed storefronts across the nation erupting in mass hysteria. For those of you who do not know, the Walmart’s One Hour Guarantee means that customers who are in the designated lines (for certain items) between 6:00 and 7:00 pm, can rest assured that they will definitely be receiving that item that same night, or before Christmas day (guaranteed!). You can view the list of available items below. Will you be participating in this years Black Friday sales bonanza?